Mulmur Rental At Lyric Pond. Has Been Featured In Shelter Magazine & Fashion Advertising. This 4 Bedroom Home Is An 1843 Barn & Log Cabin Situated On 100+ Acres With 4 Ponds, 2 Streams & Trails Through Woods. Fabulous easterly views from this summer rental. Recently renovated open concept Living Room/Dining Room/Kitchen with granite counters and stainless steel appliances. Walkout to deck and swimming pool. Fieldstone fireplace in great room. 3 bedrooms, 2 bathrooms. Master bedroom has 4 piece ensuite. Tennis court. Bunkie/games room sleeps 3 and has ping pong, pool and poker tables. Winter Rental – Fabulous Mulmur Views! Renovated farmhouse with glorious views of Mulmur Hills. 3 bedrooms, 2 full baths. Lots of natural light pouring through large windows. Trails through forest. 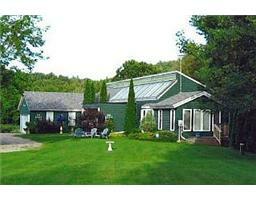 Located just 10 minutes to Creemore or Mansfield Ski Club and 20 minutes to Devil's Glen. Mulmur Rental. Quiet Rural Road. Quiet rural road. Lovely 6 acres with year round stream, trees, privacy, well maintained home. Approx. 3,400 sq. ft. of living space. Many walkouts to deck, patio and ravine. Lots of natural light on both levels.